Posted March 30, 2017 by Shelley Gist & filed under News. For Women’s History Month, we’ll be sharing weekly blog posts from Lily Lou, one of our student interns. She will be highlighting a notable and inspiring woman in each post. Why should you know about her? Grace Hopper was one of the first computer programmers. In 1934 she became the first woman to earn a Ph.D. in mathematics from Yale University, and she also served in the US Navy during World War II as a lieutenant, where she worked on the Bureau of Ships Computation Project at Harvard University building new computer technologies for the Navy. As a programmer, she developed the first compiler for a computer programming language, which is the basis of all modern day computer programming languages. She was awarded the National Medal of Technology in 1991. In 2016 she was awarded the Presidential Medal of Freedom by Barack Obama. Though she died in 1992, there is an annual computer science conference for women in her honor, the Grace Hopper Celebration of Women in Computing. Brief Biography: Grace Hopper was born in New York City in 1906. She graduated with honors from Vassar College in 1928 with a degree in mathematics and physics and earned her master’s degree and Ph.D. in math at Yale University in 1930 and 1934, respectively. She taught math at Vassar from 1931 to 1943. After teaching math, she joined the navy, where her grandfather served. 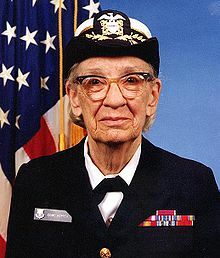 Initially, she was rejected because her weight was too low and she was too old, but she eventually became a lieutenant and worked on programming the Mark I computer during World War II, which was one of the first computers used by the Navy. After the war ended, she continued working for the Navy, programming the Mark II and III computers. In 1949, she began working for Eckert-Mauchly Computer Corporation, which was later bought by Remington Rand, a private computer company where she oversaw programming for the UNIVAC computer, which was the first commercial computer made in the United States. In 1952, she helped create the first compiler for computer languages, which translated the computer’s binary instructions to a computer coding language. When she was 60, she returned to the Navy to work on computer languages. She continued working for the Navy until she was 79, when she was a rear admiral and the oldest serving officer in the Navy. Immediately after her retirement from the Navy, she continued computing, working for the Digital Equipment Corporation. She became the first woman to receive the National Medal of Technology in 1991. She continued working until she died in Arlington, Virginia, on January 1, 1992, at age 85. There is currently a conference named in honor of Hopper that encourages women to pursue computer science and engineering. It is the largest conference for women in STEM, bringing together over 18,000 attendees. In February, Yale renamed Calhoun College to Grace Murray Hopper.